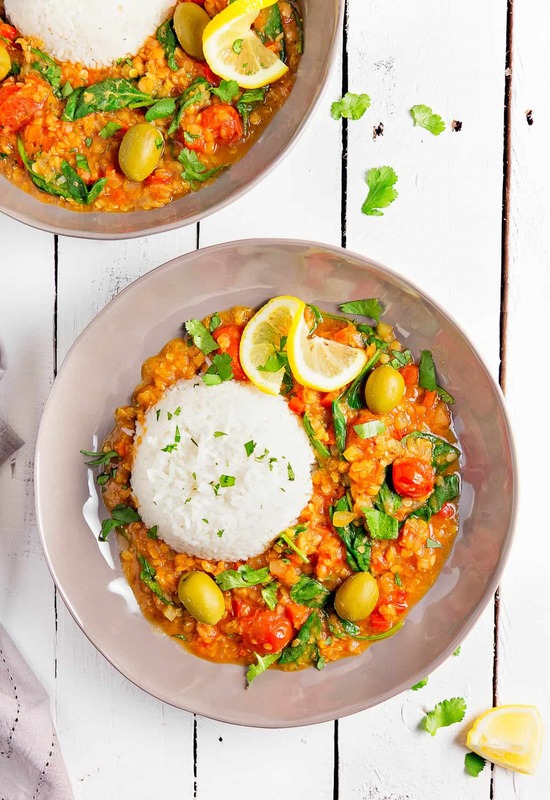 Fragrant and delicious, this soul-warming Moroccan Red Lentil Tomato Stew is easy and a delightful nod to the Moroccan cuisine. 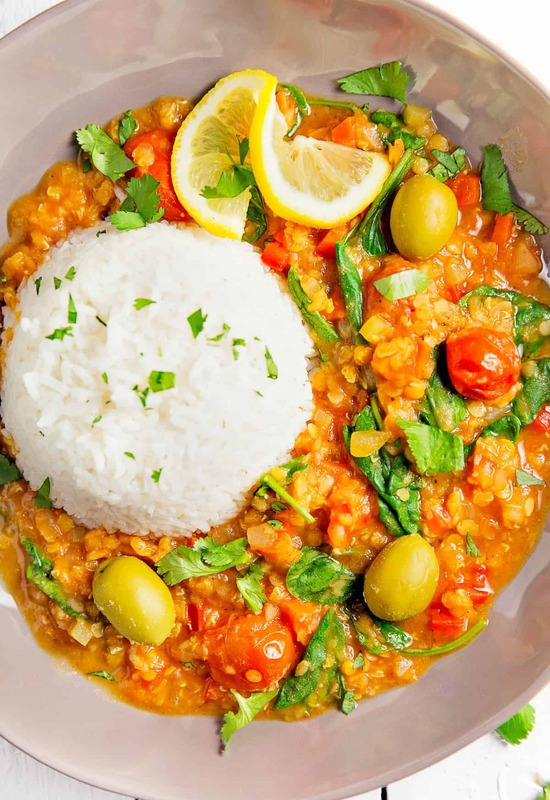 Boasting beautiful cherry tomatoes, delicious green olives, red lentils and baby spinach ensures that everyone in the family will run to the table, making it a fabulous Whole Food Plant Based stew, no oil, no sugar, no highly processed ingredients and gluten free. Stew time is always a great time in our house! We are hard-core stew lovers. I mean what is not to love, right? Deliciousness all in one bowl. It is always so nice to cozy up to a hearty and yummy bowl of stew. We love to experiment with different flavors, try new spices as well as enjoy a wide variety of different cuisines. And one of our favorite ingredients to incorporate is… LENTILS. Lentils are such a versatile legume. You can use them in just about any dish, but, they really lend themselves to stews. I really love brown lentils (aka Pardina or Spanish Brown). We tend to use them a lot. So much so that Mom orders 5 pound bags from Palouse Brand. Palouse has Non-GMO, Non-Irradiated, USA grown lentils from Palouse, WA. It is difficult to find brown lentils at our local grocery store. Maybe they just aren’t as popular as green or red lentils, as you can find the green and red lentils easy enough, but brown are nowhere to be seen in the grocery aisles . . . and of course, the brown ones are our favorite. 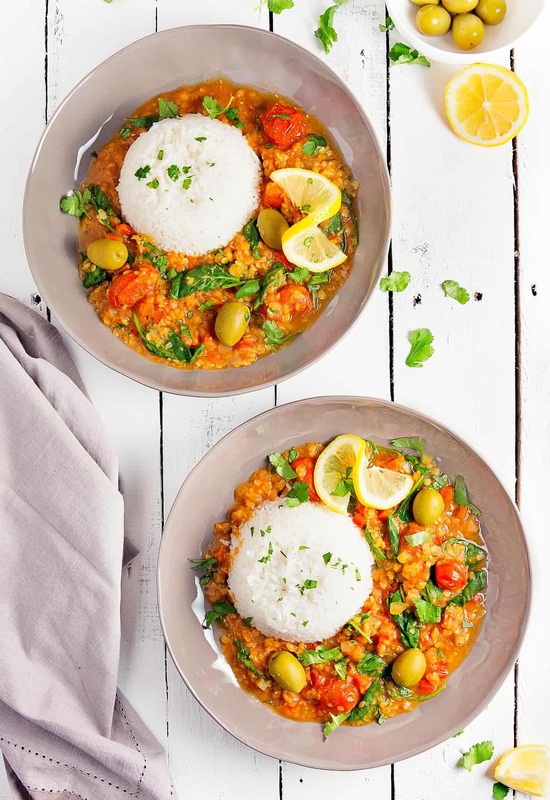 However, in saying all of that, we did decide to go with a split red lentil for this dish simply because it is a pretty lentil and it cooks really fast, which is a total BONUS! One of the beautiful things about this stew is that is comes together fairly quickly, relatively speaking for a stew. No hours and hours of cooking and simmering on the stove top. Moroccans are known for their love of spices. I have never been to Morocco, but I have had authentic Moroccan cuisine. I can attest to their impressive use of spice. 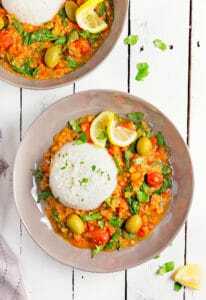 We, on the other hand, have purposefully kept the spice levels in this dish to a more moderate level to allow our readers to introduce themselves to the beauty of the Moroccan cuisine. We have placed recipe notes on how to ramp up the spices – high five to these spice-lovers out there! 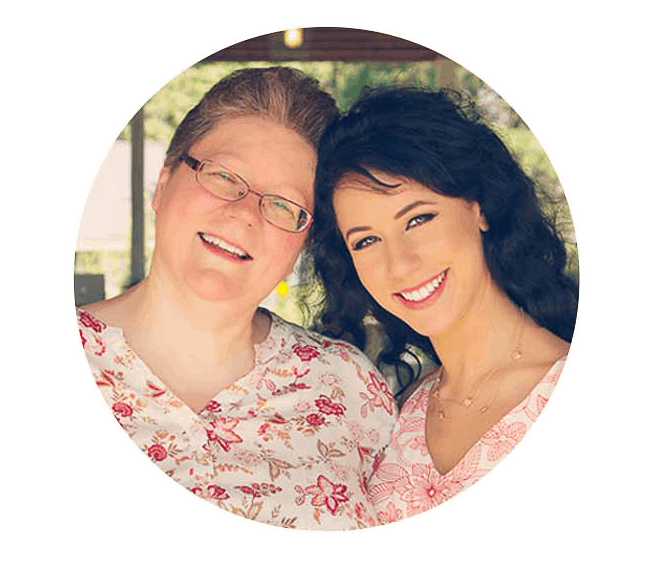 I was first introduced to Moroccan cuisine through my husband’s sister, Mary. Mary’s husband, Andre, operated the Marrakech, a family owned business, in Washington, DC. We visted this gorgous Moroccan restuarnt and I fell in love! I loved the Marrakech’s food, ambiance, and décor so much! Plus, they had bellydancers! Yay! Being a bellydancer myself, just gotta love that they had bellydancers, right? Bellydancers make every dining experience more exciting and interactive. The interior of the restaurant was as colorful as it was beautiful. The atmosphere was electric and you truly felt transported to another culture. The wait staff was dressed in traditional Moroccan clothing. The food was served in courses and each course was a delightful indulgence into the Moroccan cuisine. Marrakech was awesome… Sadly, the restaurant closed in 2013/2014-ish or somewhere around that time. I miss going to the Marrakech when we visit Mary, Andre, Alex, and Sophia in DC. Monkey reminisces fondly of Marrakesh. I wish I had had the opportunity to dine there before it closed. Say le vie. Monkey loves the Moroccan cuisine. We had previously shared our Moroccan Sweet PotatoLentil Stew, which I thoroughly enjoyed. It was soooo gosh-darned good. So, I was super excited when she wanted to create a Moroccan Red Lentil Tomato stew. It turned out delicious. I absolutely adore the slightly stewed cherry tomatoes. They are like delicious little treats sprinkled throughout the stew. AND the olives, don’t get me started on the olives. We are olive lovers in this family. I have to really control myself when it comes to olives. This stew has just the right amount of spice and what I love is that you can easily ramp up the spice if you want to. All the major components are there, you can adjust as you want. 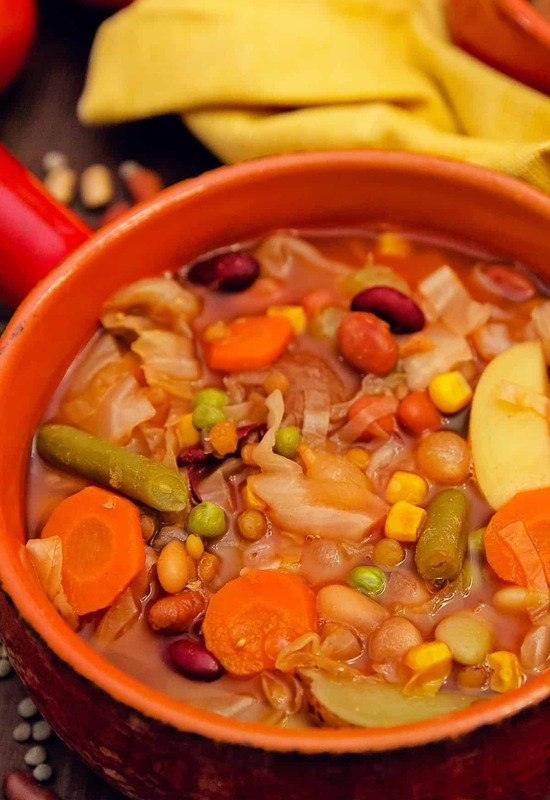 Give this stew a try, you are sure to be delighted! 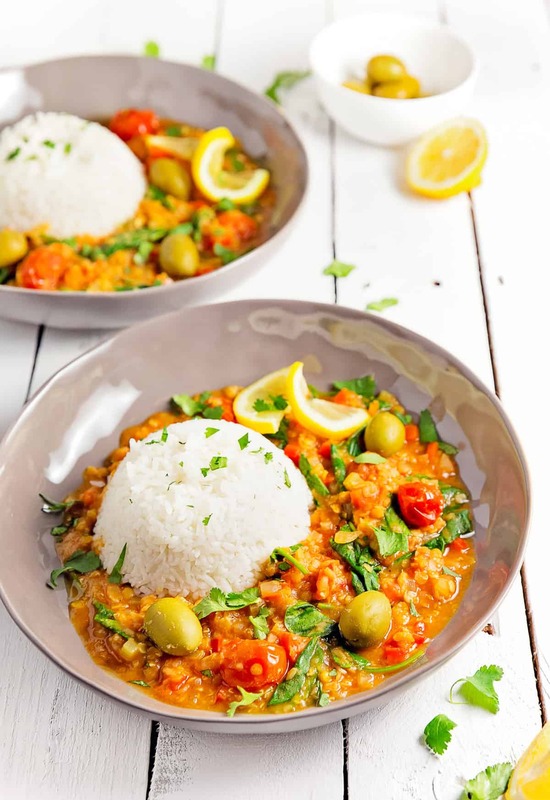 Fragrant and delicious, this soul-warming Moroccan stew is easy and a delightful nod to the Moroccan cuisine. 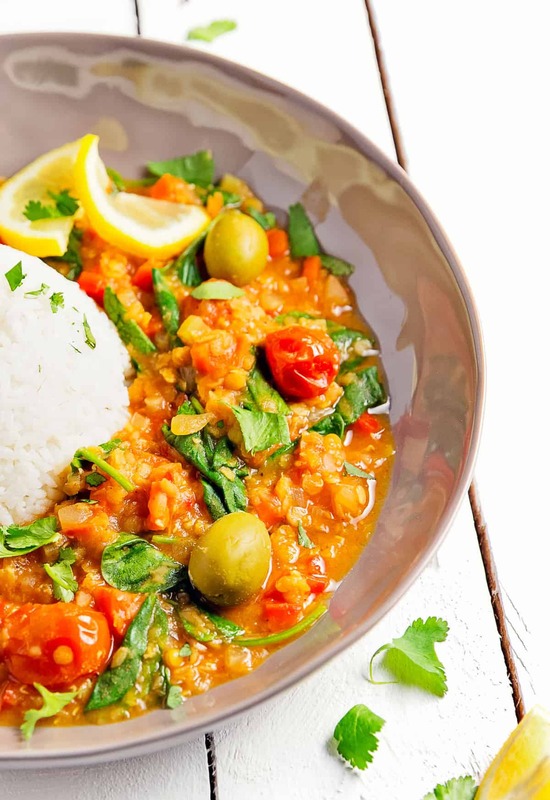 Boasting beautiful cherry tomatoes, delicious green olives, red lentils and baby spinach ensures that everyone in the family will run to the table, making it a fabulous Whole Food Plant Based stew, no oil, no sugar, no highly processed ingredients and gluten free. In a large ceramic/enamel lined Dutch oven/pot or similarly large stockpot, add the prepared veggies: onion, red bell pepper, carrot, and celery. Sauté over medium-high heat for 5 to 7 minutes to soften the veggies. Once the veggies are softened, add all the remaining Base Ingredients, red lentils, and green olives. Lower to medium-low heat, cover and simmer for 15 minutes. After 15 minutes, taste the flavor of the base. This is the time to adjust the spice flavors. See recipes notes. After you have adjusted the spice flavors, simmer a few more minutes to allow the spices to marry and taste test again. After 15 minutes and once the based flavor is where you want it, add the tomatoes and continue to cook uncovered until the lentils are tender, approx. 7 to 10 more minutes. Once the lentils are tender, remove the bay leaves and add the spinach and cook a few minutes. 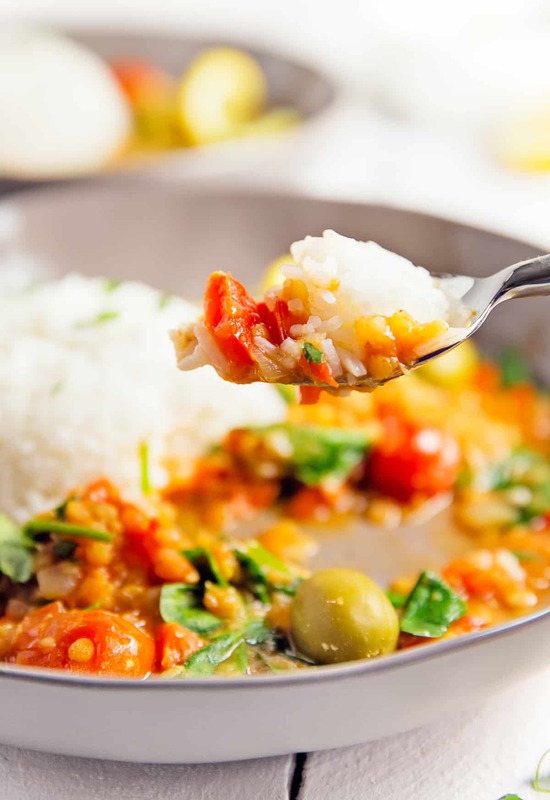 To serve, place some cooked rice into a small bowl, press down firmly with the back of a spoon to force the rice to take on the shape of the bowl. Invert the bowl of rice onto a plate and then spoon the Moroccan stew around the rice. Garnish with chopped cilantro. Enjoy! *Vegetable Stock: We use Pacific Organic Vegetable Stock. We love this brand because it is Whole Food Plant Based compliant, as it does not contain MSG, has no oil, and does not contain any highly-processed ingredients; however, this brand of vegetable stock does have a strong flavor so less broth is required when compared to the water ratio. We use a higher water to broth ratio because of this. If you use another brand of vegetable broth, then adjust the water/vegetable broth ratio accordingly. *Spices: You can control the spice level and heat level on this recipe. We have included the minimum spice amount to get a hint of the Moroccan flavors. 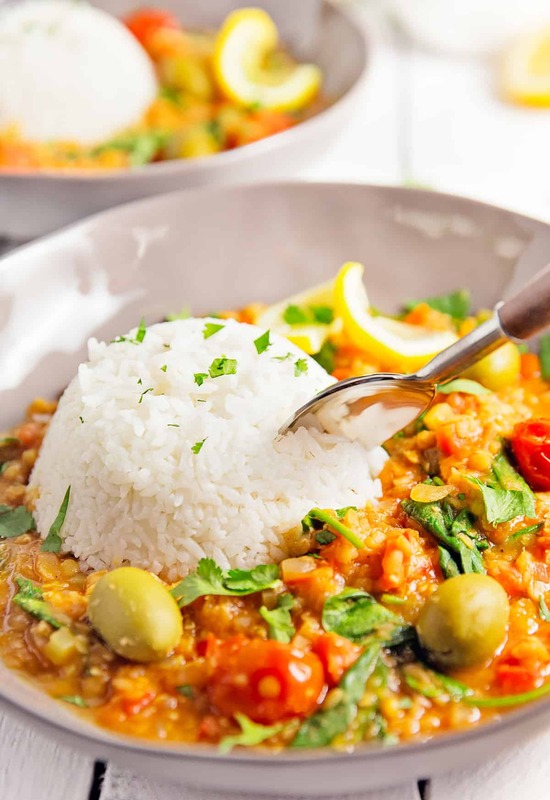 This will allow you to introduce Moroccan flavors to family members who may have not tried the Moroccan cuisine and would love to experience it. However, if you really want to spice things up, use the higher level of spice or adjust to your own spice preferences. You can really crank it up even higher by adding more spices than the recommended amounts; however, be careful, as sometimes when you add too much spice, the flavors start to compete with one another and you end up with a bitter note to your dish. *Split Red Lentils: You can substitute any type of lentil for the red lentils; however, since red lentils cook faster than other lentils, you will need to adjust the timing of adding the cherry tomatoes. For example, most red lentils cook within 20-25 minutes and we are adding the cherry tomatoes after 15 minutes, so the tomatoes are only in the stew about 10 minutes or so. If you substitute any other lentil, adjust the timing of when you are placing the tomatoes in the stew so they don’t completely disintegrate. 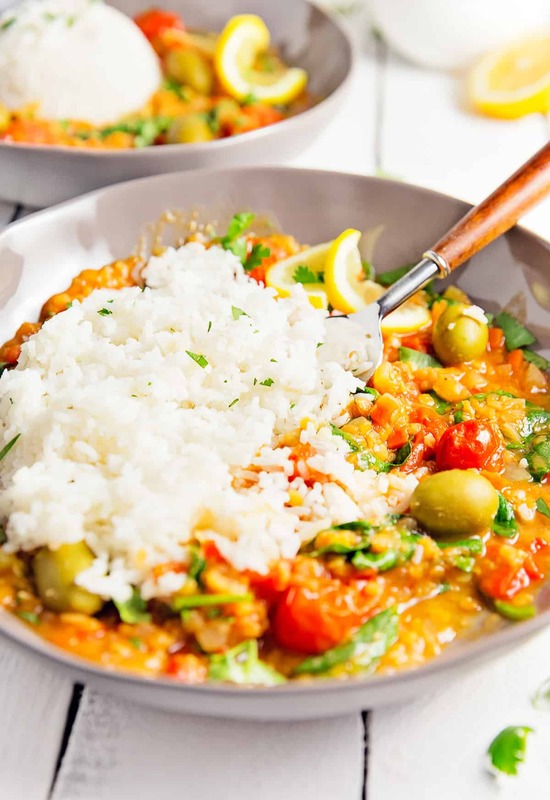 Cherry Tomatoes: One of the stars of this stew is the cooked cherry (or grape) tomatoes. They take this stew to the next level in our opinion. We used 25 cherry tomatoes. Adjust the amount of cherry tomatoes based upon personal preference. *Green Olives: Adding green olives is very much part of the Moroccan cuisine. 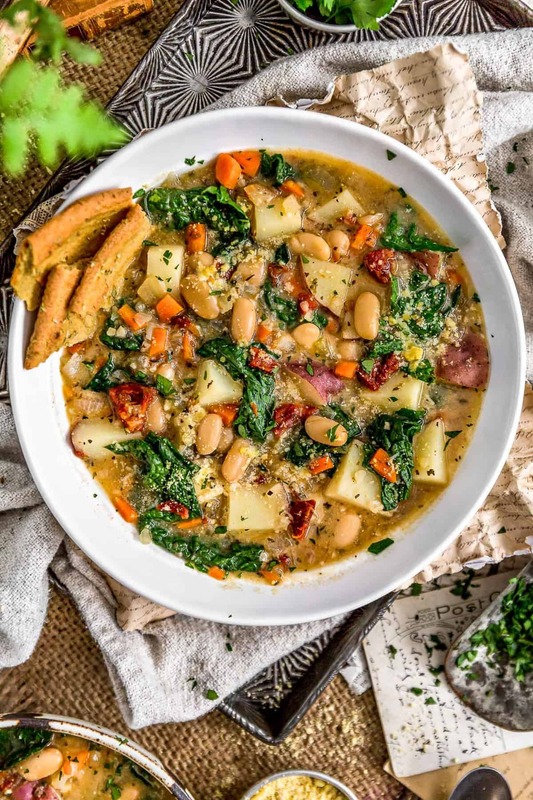 If you are concerned about the sodium content in the olives, you can totally leave them out and it will not have very much impact on the overall flavor of the stew. We are olive fiends in our house. We added whole green olives – Delallo Whole Queen (green) olives. Just be careful to remind family members that there are pits in the olives. Please feel free to add pitted green olives as well. Both are equally delicious. *Sea Salt: You may need to add some sea salt. We added 2 teaspoons as we felt the added sea salt add some additional flavor. This was fantastic!!! I had to make some modifications to make it child friendly, but great flavor. All four of us enjoyed it, even my three year old! 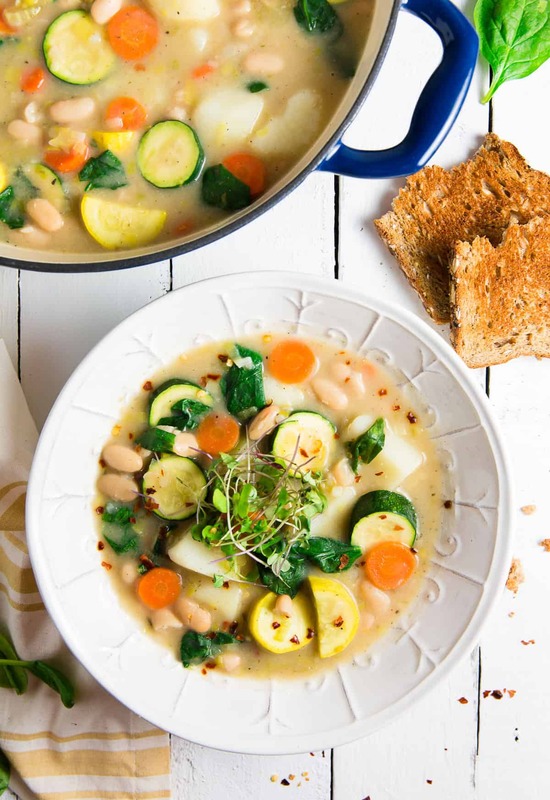 Will make again for sure….nice to have plant based recipes to turn to sometimes. I recommend adding chopped dried apricots to round out the flavour. What a great addition! Thanks for your awesome suggestion!